The theme this week in Take a Word is RED AND GREEN. I'm sending you a big and warm bear hug and my wishes of a wonderful Christmas. Mask: Studio Manu; texture: Kim Klassen; bokeh overlay: Shadowhouse Creations. You have interpreated green and red very beautifully in many shades. Love your collage - and Audrey. I wish you a happy seasontime, Christine. Lots of 'oooohs and ahhhhs' from my corner, Christine, standing ovation from me!! 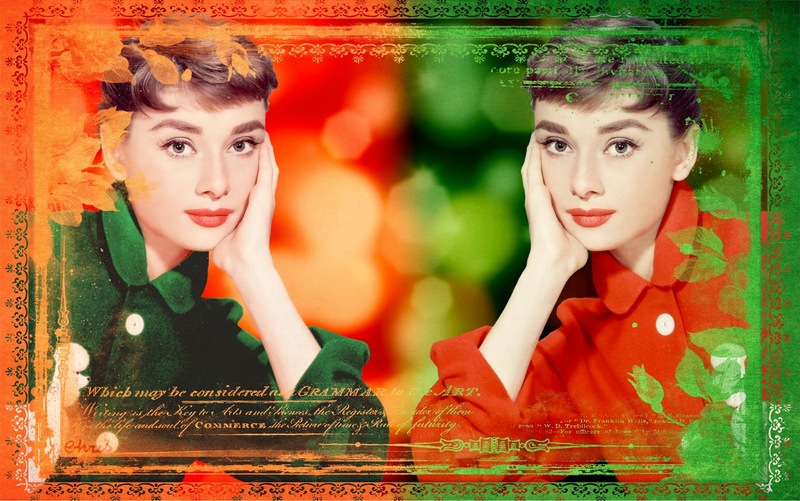 Audrey is gorgeous in any color beautiful work. Have a wonderful Christmas Christine. The beautiful Audrey didn't look like she ate too many chocolate cakes in her lifetime. This is an amazing and gorgeous piece of art. I love it. HAPPY NEW YEAR!